Team GB Womens’ Hockey Gold Medalist Georgie Twigg “comes home” this weekend to Lindum Hockey Club. 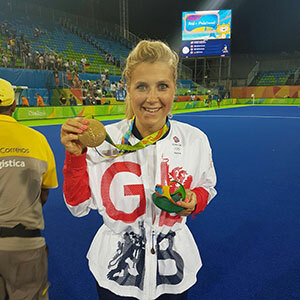 Fresh from her heroic display in Rio, Lindum Hockey Club are delighted to announce that Georgie Twigg, Olympic Gold Medal Winner, will be attending junior training on Saturday the 10th September from 9am to 11.00am. We are so excited to welcome Georgie back to the club where her Olympic journey started and are incredibly grateful that she will be inspiring the next generation of Lincoln hockey players. The children (and the older club members) are getting ready for a glimpse of gold! The whole club will be coming together at 10.00am to show her how proud we are of her and all of her achievements It will be a wonderful reunion for Georgie and one of her first coaches, Tony Perrin, who first coached Georgie (or Twiggy as she is affectionately known).